Growing up in California, Mark Nagata was a fan of Disneyland, comic books, and classic Japanese television shows, movies, and toys. These influences inspired his creativity and spurred his initial interest in drawing and art. Fast-forward to today and not much has changed for this toy designer, painter, illustrator, and collector. After attending the Academy of Art College in San Francisco during the late 1980s, Nagata embarked on a 10-year plus journey as a freelance commercial illustrator. During this time he worked with a diverse client list that included Scholastic Books, Lucasfilm, DC Comics, Hasbro Toys, IBM, Sony, and others. A highlight of this time included Nagata’s colorful paintings gracing the covers of several books in R.L. Stine’s series, Give Yourself Goosebumps. In 2001, Mark transitioned from illustration to co-founding Super 7 magazine, a publication dedicated to vintage and art vinyl toys. Through his work on the magazine, Nagata combined his passion for Japanese vinyl toys with his own artwork. It was during this period that Nagata founded Max Toy Company (2005). He started the company with the mission to specialize in custom and limited editions of kaiju toys and artwork. Many of the original toys produced by his company are hand painted by Nagata, exhibiting his skills acquired during his career as an illustrator. Nagata’s original paintings, toys, and a selection of his vintage toy collection were featured in the exhibition, Beyond Ultraman: Seven Artists Explore the Vinyl Frontier (2007) at the Pasadena Museum of California Art in collaboration with the Los Angeles Toy, Doll and Amusements Museum. This marked the first museum show that explored the world of art toys by California artists. Continuing to spread the kaiju and art toy movement into new uncharted areas of the art world, in 2008 Nagata sold hand-painted custom toys through the prestigious auctions houses, Philips De Pury and Christie’s in New York and London. In 2009, Nagata curated Mark Nagata and Kaiju Comrades art show in Tokyo, Japan, which brought together artists from different aspects of the kaiju toy movement in this first of its kind art toy show. In 2010, Nagata co-curated the first kaiju art show in Barcelona, Spain with Emilio Garcia called Kaiju Attack. Later that year, Nagata lectured about kaiju and the toy making process at the Morikami Museum in Delray Beach, Florida. Much of Nagata’s world-renowned Japanese toy collection—including many from his massive Ultraman collection—was on display in 2013 through 2014 at SFO Museum in the San Francisco International Airport. The exhibition, Japanese Toys! From Kokeshi to Kaiju, showcased the incredible diversity and growth of Japanese toys with many of Nagata’s favorite vinyl kaiju figures prominently featured. The exhibition also served as a great introduction to the captivating art form of toy design for tens of thousands of bustling travelers to and from Nagata’s hometown. Additionally, toys designed by Nagata and his writing have appeared in Eiji Tsuburaya: Master of Monsters: Defending the Earth with Ultraman, Godzilla, and Friends in the Golden Age of Japanese Science Fiction Film (Chronicle Books), Killer Kaiju Monsters: Strange Beasts of Japanese Film (HarperCollins Publishers), Full Vinyl: The Subversive Art of Designer Toys (HarperCollins Publishers), Dot Dot Dash: Designer Toys, Action Figures And Character Art (Die Gestalten Verlag), Art-Toys and Beyond Ultraman: Seven Artists Explore the Vinyl Frontier (Baby Tattoo Books), along with Super 7 Magazine, Otaku USA magazine, Hyper Hobby magazine, and others. 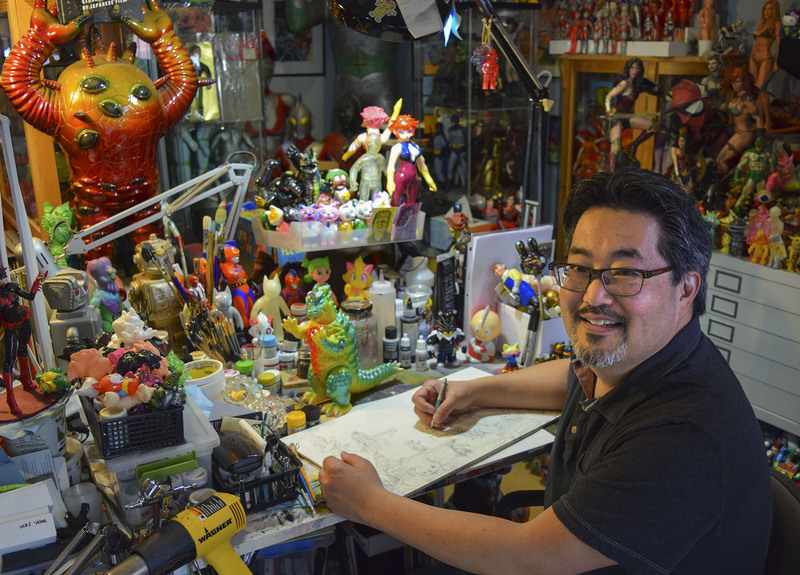 An interview with artist/toy collector Mark Nagata produced for the exhibition by the JANM Watase Media Arts Center. Read a 2007 article by Mark Nagata about how he became interested in Japanese toys on JANM’s Discover Nikkei website. Highlights from JANM Free Family Days: Superheroes! © 2018 Japanese American National Museum. 100 N. Central Ave., Los Angeles, CA 90012.